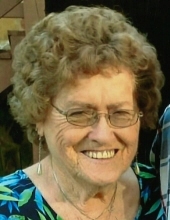 Mrs. Mary Ann Wood, age 80 of Bowdon, Georgia, passed away on Thursday, November 22, 2018. She was born June 15, 1938 in Haralson County, Georgia, the daughter of the late Claud Marvin Hammond, Sr. and the late Mildred Weathington Hammond. She retired from Kroger’s in Carrollton with over twenty years of service. She had formerly worked for Hubbard’s as a seamstress and was a member of Salem Baptist Church in Carrollton. Survivors include her husband, Jesse James Wood; children: Tony James Wood and Delores Diane Bell, both of Bowdon, Georgia, Rickey Lee Wood, and his wife, Jenita Lynn Wood, of Rising Fawn, Georgia, and Timothy Mark Wood of Bremen, Georgia; brother and sister-in-law, Walter Lee and Jackie Lee Hammond of Buchanan, Georgia; sister, Sarah Hammond Chupp of Temple, Georgia; grandchildren: Crystal Marie Richards of Bowdon, Georgia, Casey Lee Wood of Sharpsburg, Georgia, Andrew James Wood of Athens, Georgia, Troy Jesse Bell of Carrollton, Georgia, Ashley Lynn Hallman (Wood) of Rising Fawn, Georgia, Brandy Nicole Wood of Dothan, Alabama, Zac Bell of Carrollton, Georgia, and Dylan Dakota Wood of Bremen, Georgia; and ten great grandchildren. Funeral services will be conducted Tuesday, November 27, 2018 at 2:00 PM from Martin & Hightower Heritage Chapel with Minister Milford Ballenger officiating. The following gentlemen will serve as pallbearers: Andrew Wood, Casey Wood, Austin Glover, Troy Jesse Bell, Zac Bell, Dylan Wood, Benny Hallman, and Randall Sticher. Interment will follow in Carroll Memory Gardens. The family will receive friends at the funeral home on Monday evening from 5:00 PM until 8:00 PM. Messages of condolence may be sent to the family at www.martin-hightower.com. Martin & Hightower Heritage Chapel has charge of the arrangements. To send flowers or a remembrance gift to the family of Mary Ann Wood, please visit our Tribute Store. "Email Address" would like to share the life celebration of Mary Ann Wood. Click on the "link" to go to share a favorite memory or leave a condolence message for the family.